NOVASHE will adjust targeting consumers from 25 to 35 years old females and they have decided to give more rights to their own designer team to express their opinions on product selection and brand operation to provide more qualified products and service for their customers. The famous fashion brand - NOVASHE recently claimed that they will adjust targeting consumer positioning and launch Fall Winter 2017 product series which is consistent with their new positioning in Mid-July. According to this, NOVASHE will be devoted to serving females during 25 to 35 years old, which NOVASHE calls them as "Light Mature Women". NOVASHE will build a new fashion brand of outstanding and elegant styles at affordable prices for their consumers. 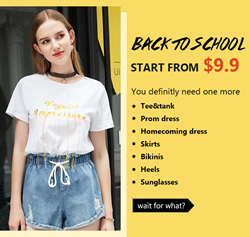 NOVASHE will provide various delicate fashion products for middle class ladies and create a brilliant, fashionable life for those mature, independent, noble and confident ladies. Since established several years ago in the United States, NOVASHE products have mainly bought from some qualified suppliers while part of the products are designed by their own designers. Under this model, they always make their products cost effective by lower prices. What’s more, NOVASHE does not have a clear style of their own brand. Their targeting consumers are highly overlapped with the targeting consumers of some fashion brands, like ZARA and Forever21. The ages of the targeting consumers are between 17 and 35 years old, in which consumers of 25 to 30 years old matter most. But NOVASHE has already served over 1 million fashion ladies from 17 to 22 years old. As they are getting older, NOVASHE will mainly served ladies who are 25 years old or older since Fall Winter 2017. Plus, NOVASHE’s unclear style will be changed this year and they are more confident about earning more shares in North American and European market in the future. Starting from Fall Winter 2017 and Spring Summer 2018, NOVASHE decides to give more rights to their designer team to express their opinions in product selection and brand operation so that they can strengthen product identification and enhance their market competitiveness. NOVASHE plans to work with young designers from the world's leading clothing academies (e.g. Marangoni and ESMOD). In a word, NOVASHE will still be a cost-effective fashion brand in the future. According to NOVASHE brand-operating department, NOVASHE plans to cooperate extensively with the fashion street-shoot stars worldwide. At present, NOVASHE has already been in contact with more than 4000 fashion bloggers active in Instagram, Pinterest, Facebook and Youtube to build a more attracting brand together in the future.